The wetland committee met on 28 July. We had a visitor – Richard Heyward from the Otago Regional Council. He works with the community to make sure everyone is looking after our environment, and he’s enthusiastic about what we are doing at the wetland. 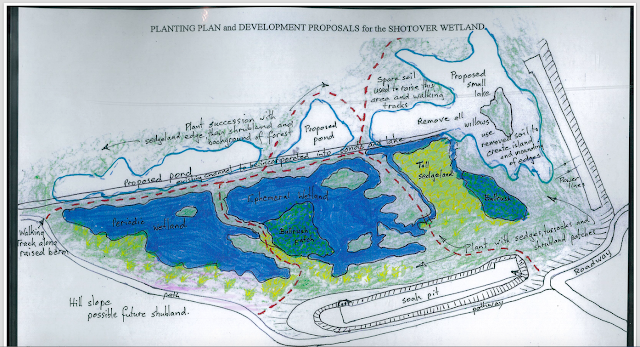 We will ask Richard to talk to the Shotover Wetland Squad about his work. We’ve been talking about how to enhance the wetlands by adding walkways and making the wet areas larger. Neill has developed a design, which he and Shayne and Grant will develop further. The Otago Regional Council has a fund of money for ecological enhancement projects that benefit the community. With your help we are hoping to put in an application that, if successful, will help us pay for the costs of the enhancements. Jill also showed us the goals that the Shotover Wetland Squad have developed for the project. We love that you want to get your hands dirty!